In the wake of the ongoing conflict between Hamas terrorists and the Israel Defense Forces, all over the world anti-Semitic incidents have reached figures unprecedented since the Nazi era. In the U.K., a local charity has reported that anti-Semitism in the area has been up a staggering 500% since the outset of Operation Protective Edge; in Sweden, a mother of four was beaten and harassed for simply wearing her Star of David pendant; in South Africa, politicians have condemned the State of Israel by comparing it to Nazi Germany; in Ireland, protesters have taken to supermarkets to expel its Israeli products, wearing pro-Palestinian shirts; yesterday, in Philadephia, a Jewish student was physically and verbally attacked by members of the Students for Justice in Palestine, simply for trying to hold a peaceful conversation with them. Sadly, this list can go on and on. A recent study by the Anti-Defamation League has confirmed a "dramatic surge" in global anti-Semitism, saying violence against Jews and Jewish institutions has "metastasized" during Israel’s Operation Protective Edge in July and early August. Some European and Israeli leaders fear that this could be the start of a "new" Holocaust. Many Jews, particularly in Europe, have chosen to remain in their homes as the war rages on, hoping that normality will ensue once a permanent ceasefire is reached. But in Toronto, home to a large and incredibly diverse community, residents both Jewish and non-Jewish have proven that they "will not be silent." Last night (Wednesday) at an event organized by UJA Federation of Greater Toronto, over 4,000 Torontonians arrived to declare their solidarity with the people of Israel, and to demonstrate that in the wake of rising anti-Semitism, we will not be silent. Nor, will we will not allow global anti-Zionism or anti-Semitism to intimidate or harass us. Showing up at the Holy Blossom Temple (near the corner of Bathurst and Eglinton), the residents of Toronto showed their unwavering support for Israel: we arrived dressed in blue and white, proudly waving Israeli and Canadian flags, as we took to the street. We sang Hebrew folk songs, we marched peacefully in unison (as cars drove by and honked in support) and arrived at our destination: Bialik Hebrew Day School, where we were addressed by Israel's Consul General to Toronto, DJ Schneeweiss, Holocaust survivor Bill Glied, Diller graduate Leora Nash, and internationally renowned journalist Martin Himel. The event's Master of Ceremonies was one Shael Rosenbaum, Vice Chair of UJA's Sarah and Chaim Neuberger Holocaust Education Centre. The objective of the evening was clear: to educate the residents of Toronto of how this international surge of anti-Israel behavior stems from anti-Semitism, and that the parallels of the Holocaust to the demonization of Israel that is currently taking place around the world does indeed exist. "I see the placards that spew blatant anti-Semitism in Berlin, Paris and London," said an impassioned Glied. "This, after the Shoah, after six million [lost their lives]. 'Hamas, Hamas Jews to the Gas' sounds ominously like the 'Juden-raus' ["Jews Out"] I heard in 1939. This is not anti-Israel: this is crass Jew hatred. And when George Galloway, the Member of Parliament for the English city of Bradford, says 'Bradford is an Israel free zone', it sounds very much like the 'Juden-rein' ["Clean of Jews"] cities of Nazi Germany." Glied spoke of his goal to educate others, to teach the youth of the atrocities of the Nazis, and, also, those who sat idly by and did nothing as millions of innocents were exterminated. "I tell them that the difference between animals and humans is that we humans have a conscience that as human beings we must listen to our conscience and always do the right thing. And now I ask: silent majority throughout the world, where are you? Have you listened to your conscience? Don’t let a small group of crazies infect the world with their poisonous hatred. Speak up! Join us in our quest for freedom, for democracy." Glied's sentiments were reiterated by acclaimed journalist Martin Himel, an award winning documentary film-maker and television correspondent with over 25 years experience. Himel spoke of his experiences in Egypt, in Gaza, and in the Middle East. He talked about speaking to members of Hamas, and members of Fatah. And the overall premise of his address was clear: Israel is often held to a double standard. Why didn't the U.S. receive international condemnation, and condemnation from the United Nations, like Israel does when it defended itself against terrorists during the war in Afghanistan? Where is the condemnation for ISIS and its ethnic cleansing of Syria and Iraq? Why is Israel always deemed 'the culprit' when it defends itself against terrorist groups that are focused on exterminating her entirely? How is the fact that Hamas' charter - which repeatedly calls to eliminate Jews and the people of Israel - not mentioned by the media? The answer, he explained, is deep-rooted in anti-Semitism. The Jews have survived for thousands of years, said Himel. We survived the Crusades, the pogroms, the Shoah. And, despite the outcry of international condemnation against Israel, despite the rise of anti-Semitic hatred around the world, we will continue to survive. The thousands in attendance at yesterday's event in Toronto will see to that. The thousands who arrived for a pro-Israel rally in London last month will make sure of that. The Jews who proudly wear our Stars of David, who proudly wear our yarmulkes, who proudly continue our traditions, will see to that. The 20,000 Indian residents who marched in solidarity with Israel - possibly the biggest pro-Israel rally of the last decade - will see to that. 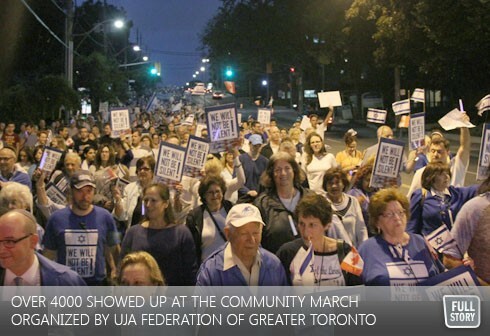 "It was simply amazing to see 4,000 community members, young and old alike, walking side by side through the centre of the city in support of Israel and the fight against injustice and anti-Semitism," said Ted Sokolsky, President & CEO, UJA Federation of Greater Toronto. "Despite the rain, their spirits never wavered." In the words of Bill Glied, who empowered us all with his emotional address, "Thank God for the IDF. Thank God for Israel. And remember together we must stand: NEVER AGAIN."